On December 17, 1903, the first successful engine-powered, manned airplane was flown by Orville and Wilbur Wright. It speaks volumes for the rapid rise of photography that a camera was present at Kitty Hawk on the historic day in 1903 when Orville and Wilbur Wright's Flyer I first took to the sky. The honor of pressing the shutter button actually went to John T. Daniels, who'd come from the nearby Coast Guard station to observe the endeavors of what he termed "a pair of poor nuts." The famous first flight, seen here, spanned 120 feet (37 meters) and lasted 12 seconds. 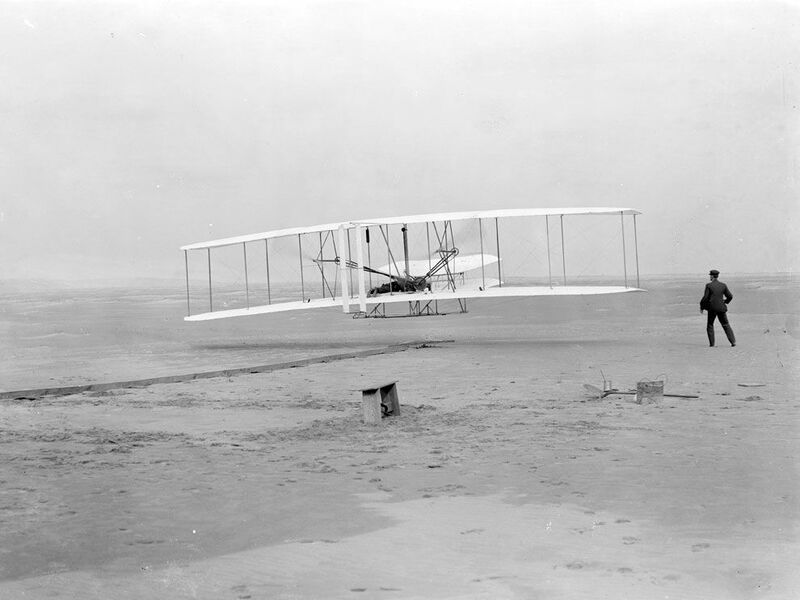 On December 17, 1903, the first successful engine-powered, manned airplane was flown by Orville and Wilbur Wright. In a field near Kitty Hawk, North Carolina, the brothers flew their machine, the Wright Flyer, about 37 meters (120 feet) in 12 seconds. In the following months and years the Wrights built planes that went much farther and faster than their first short hop. The Wright brothers’ success, along with the work of others, jumpstarted the age of air transport. Aircraft are now used for all kinds of travel and shipping. A trip around the world that once took weeks or months now takes less than a day. The Wrights’ innovation also allowed engineers to set their sights even higher than the sky. To recognize this, astronauts took a small piece of the Wright Flyer to the moon on the first lunar landing in 1969.
carrying one or more people.